Physician-Patient Alliance for Health & Safety asks "What are you doing for Pain Awareness Month?" CHICAGO, Sept. 19, 2017 /PRNewswire/ -- The American Chronic Pain Association asks people to "not just sit there" and "Give a Squat 4 Pain" in honor this month of Pain Awareness Month. 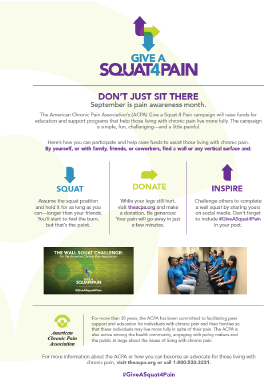 To view an infographic in support of "Squat 4 Pain", please click here. In advocating for a balanced approach to opioid prescribing, Mr Wong reminds clinicians that they should ensure that all their patients receiving opioids should be monitored to ensure their safety and prevent opioid-induced respiratory adverse events and death. For further details on why all patients receiving opioids should be monitored, please click here. Physician-Patient Alliance for Health & Safety is a non-profit 501(c)(3) whose mission is to promote safer clinical practices and standards for patients through collaboration among healthcare experts, professionals, scientific researchers, and others, in order to improve healthcare delivery. For more information, please go to www.ppahs.org.